Many numerical studies, among them, global and regional models, have been used to simulate climatic impact due to Amazon deforestation. Most of them did not consider deforestation as usually observed and the induced dynamic changes. The present study explores the physical impacts due to Amazon deforestation by considering local and remote changes in the circulation and thermodynamics. For this, numerical experiments were conducted with RegCM3 using a relatively fine horizontal grid spacing (50 km), more realistic deforested areas (similar to the highway-network-shaped), and an updated land use map. The studied period was 2001–2006 October–March. As in most previous studies focusing on Amazon deforestation, the RegCM3-simulated air temperature increases over degraded areas, ranging from 1.0 to 2.5 °C, and precipitation decreases of around 10 %. This result is mainly related to depletion in evapotranspiration rates provided by lesser soil water extraction by the degraded vegetation. 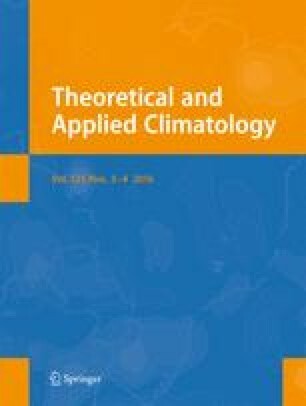 The weakening of upward motion in the mid-upper troposphere is an associated mechanism that explains the precipitation decrease after Amazon deforestation. A new result is the simulated precipitation increase, about 10 %, over the eastern South America and the adjacent South Atlantic Ocean. In these areas, the precipitation increase during October–March is associated with intensification of upper-level high pressure (the Bolivian high) coupled with negative geopotential height anomalies southeastward of the center of the high. The authors wish to thank NOAA’s ESRL in Boulder, CO, for providing reanalysis data (http://www.esrl.noaa.gov/psd) and the Global Land Cover Characterization (http://edc2.usgs.gov/glcc/sadoc20.php# vers2) for the land use data. The first author acknowledges the support from Sao Paulo Research Foundation (FAPESP) under Process N. 2007/07834-3. RP; da Rocha acknowledges CNPq (307202/2011-9 and 307547/2014-0) and CAPES.